Thank you for your interest in participating in our research! Participants are currently being recruited for several ongoing studies. We are recruiting adults without neurological or psychological conditions (18 and older, right handed, native speaker of American English) as well as individuals who have had a stroke at least six months ago. All participants are compensated for their time. Behavioral (language and cognitive assessment) testing at ASU COOR Hall or another convenient place for the participant. During the MRI scan you will be asked to lie still on a stable that will be moved into a donut-shaped magnet (like a tunnel). You will be asked to passively listen to stimuli composed of speech and music. Listen to various kinds of sounds (speech, music, tones, or noises) over headphones, or view various kinds of visual stimuli (pictures or words) on a computer screen. Respond to these stimuli either by vocalizing into a microphone or by pushing a button. Your responses will involve making simple yes-no decisions about what you are hearing or seeing, or involve naming or repeating the stimulus item. Your responses will be recorded by a computer or the experimenter. We are able to make any and all accommodations necessary (e.g. pointing to answers, using AAC devices, etc), so please do not hesitate to ask. We are interested in understanding communication difficulties older adults often encounter in their everyday lives, particularly speech that occurs in noisy environments. 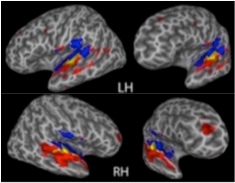 The goal of this study is to explore the interaction between speech comprehension, cognition, and the brain regions involved in understanding complex speech in older adults. We are actively recruiting individuals without brain injury who are between the ages of 60 and 75, right handed, and a native speaker of American English. Respond to these stimuli either by vocalizing or by pushing a button. Your responses will involve making simple yes-no decisions about what you are hearing or seeing. Your responses will be recorded by a computer or the experimenter. For information about the availability of these projects, please contact us. We are excited to hear from you! Currently, we have exciting opportunities for individuals without brain injury who are 18 years and older, right handed, and a native speaker of American English. We have both behavioral and fMRI studies available. These studies may include visual and auditory stimuli and a variety of simple tasks. Participants can either be compensated with course extra credit (if offered by your course professor) or monetarily.